Much like last week’s episode, The Fosters 5×13 is a busy one for Lena. This week, she grapples with multiple workplace roles (principal, vice principal, and paraprofessional) and a wife who’s sick in bed. Between navigating her first day as principal, watching Tess and Jenna flirt while receiving text-messaged directives from a concerned Stef, and handling the sandy manifestation of Brandon’s 11th-hour senior prank, she’s exhausted. Although a somewhat terse late-night conversation with Stef could easily have devolved into conflict, both emerge with helpful guidance from the other to use the next day. After being told that she’s getting too involved in Tess and Dean’s drama, Stef lays down the law by telling Tess that her neighbors’ relationship issues are none of her business. Similarly, Lena elects to respond to the senior prank lightheartedly by showing up to school in a bathing suit. 2. Everyone communicates like grown-ups. In response to pressure from Mat, Mariana initially decides to break things off with Wyatt and Logan. As The Fosters 5×13 continues, however, she reconsiders thanks to a sweet exchange with Wyatt and an overheard conversation between Brandon and Mat. When she tells Mat about her final decision, he’s understandably upset but also respects her choice and the thinking that led to it. She comforts him in response to his fears about the future, and their conversation ends with a hug. 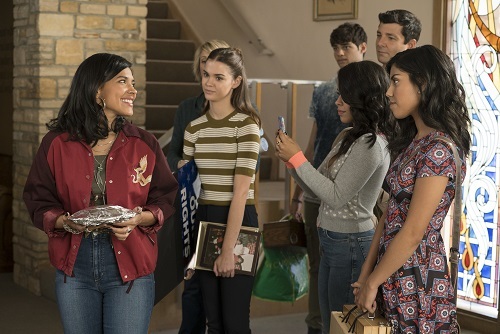 Poor Ximena has been cooped up inside Noah’s mom’s church for the entirety of season 5B, but she’ll be able to venture out if a judge grants her a temporary stay of deportation. In The Fosters 5×13, Ximena, Callie, and student activist Sean try their best to make that happen. As Ximena is unable to attend her hearing in person, Callie films her statement for the judge, and then – despite a supremely unhelpful interaction with a member of UCSD’s Conservative Student Union – Callie and Sean collaborate to track down the footage of Ximena’s speech in The Fosters 5×06. Satisfied that nothing Ximena said constituted a threat to national security, the judge grants the stay. Now Ximena can live at Stef and Lena’s house until her DACA status is (hopefully) approved and she can become Poppy’s legal guardian! Ximena’s long-awaited departure from the church is joyful. Supporters and journalists are outside to greet her – and an ICE agent is watching in the distance. Eager to resume as much of her routine as possible, Ximena jumps right back into coaching roller derby. The agent watches Ximena and Callie walk out of the practice space and head to separate cars, at which point he follows… Callie. Did he mean to tail Ximena? Is he going after Callie because Ximena is now protected by the stay? And how does the new camera given to Callie by Robert as an early graduation gift fit in? Tune in next Tuesday at 8/9c for answers.